Timers are used whenever electrical equipment must be periodically switched on and off at preprogrammed daily or weekly times. The programmed events are then repeated during the next periods accordingly. They find broad application in audio/vidoe systems, boilers, ovens, dryers, defrosting equipment, swimming pools, hatcheries, illumination, etc. 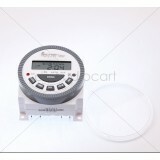 Digital Programmable Daily, Weekly Timer Multipurpose Features & Detailed P..